Energy Go Stix will help you power through your busy day, with zip to spare! Infused with 4Life Transfer Factor E-XF™ and a clever blend of energy-boosting ingredients, simply mix one citrus-orange pack with eight ounces of water and you’re good to go… and go… and go! Yerba mate supports healthy energy levels within the body. Green tea is one of the most studied natural products in the world. 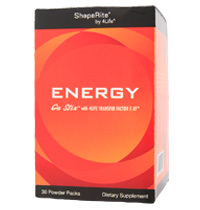 It helps support healthy weight management through thermogenesis. Native to the Amazon basin, guarana provides your body with powerful support for healthy energy levels all day long. Energy Go Stix includes 4Life’s Transfer Factor E-XF to give you a powerful immune boost from transfer factors sourced from cow colostrum and chicken egg yolks. Maltodextrin, Natural Flavor, Citric Acid, L-Arginine, L-Glutamine, Taurine, Green Tea Extract, Yerba Mate, Creatine Monohydrate, Ornithine Alpha-KetoGlutarate, LCarnitine, Siberian Ginseng, Guarana, Maca (Lepidium meyenii), Transfer Factor E-XF, Beta-Carotene (as color), Rhodiola Rosea Extract, Acesulfame Potassium (Ace-K), American Ginseng Root, Riboflavin, Korean Ginseng, Silicon Dioxide, Sucralose, Xanthan Gum, Chromium Polynicotinate.